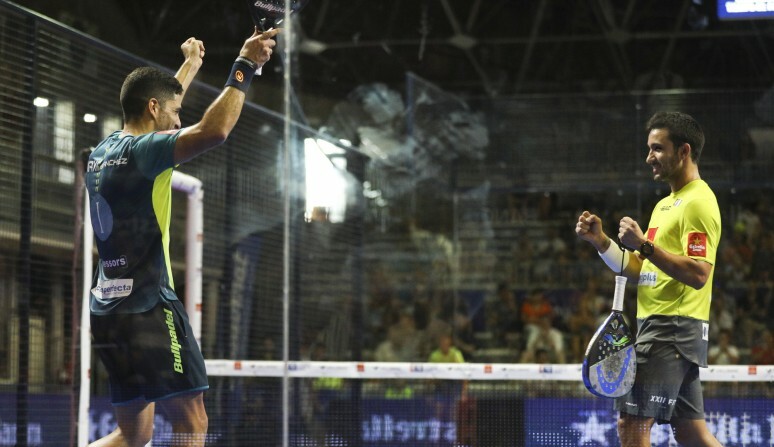 After two nail-biting semifinals with extraordinary padel, expectations were high for the final. The two best pairings of the week took to centre court to try and lift the trophy: Maxi Sánchez and Sanyo Gutiérrez versus Franco Stupaczuk and Cristian Gutiérrez. The four players didn't take long in demonstrating why they were in this exclusive round. The first set was an onslaught of breaks. Stupaczuk and Gutierrez went 5-3 up and served for the set but the duo from San Luis fought back to make it 5-5. Cristian and Stupa broke for the third time, however, and won the first set 7-5. The second set was the reaction of the world number two pairing, and number one seeds this week. They pinned their opponents back from the start and went up 3-1. This time there would be no break back opportunities and Sanyo and Maxi won the second set 6-4. In the third set, Cristian Gutierrez needed treatment from the physio for an ankle injury. Maxi and Sanyo broke in the seventh game and went 4-3 up. That was the decisive moment of the match as they held on to win 6-4. Maxi Sanchez and Sanyo Gutierrez win their fifth title of the season. Maxi and Sanyo are the champions of the Vallbanc Andorra La Vella Open 2018.